Keyboard manager has a tilt range of up to 10 degrees, 360-degree swivel and unlimited positions within height range from 1-1/8" to 4-3/4". To adjust height and tilt, twist the single knob loose to reposition keyboard manager, hold in place, and then retighten knob to lock in position. Keyboard tray swivels to the right or left and swings back underneath worksurface for convenient storage. Mouse tray mounts to the right or left side of keyboard tray. Both keyboard and mouse trays include soothing, foam wrist rest supports. Sliding arm lets you pull keyboard tray closer to you for ease of use. Made of solid, 2mm thick steel for lasting performance, cord management feature prevents tangled cords. 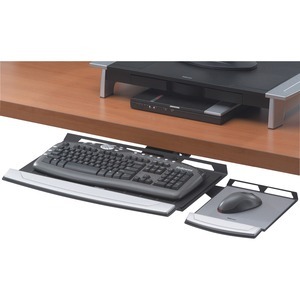 Keyboard tray with 17-1/2" track will work in standard workstations.